Observatories NASA Hubble Postdoctoral Fellow Maria Drout will receive the tenth Postdoctoral Innovation and Excellence Award (PIE). 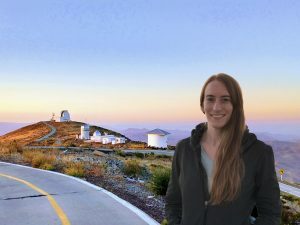 She was one of four Carnegie astronomers who, along with colleagues from UC Santa Cruz, provided the first-ever glimpse of two neutron stars colliding last August. She was first author on a Science paper, which measured the changing light from that merger to shed light on the origin of the heaviest elements in the universe.. The discovery was widely covered by the media and opened the door to a new era of astronomy.